time for some fun with flickr! If you don’t already know, I enjoy Flickr *very* much. You can find me under the name “bleeding espresso” and always see my latest photos–I don’t post all my photos on the blog, so please feel free to add me as a friend to be kept up to date! Before I got involved with Flickr, I didn’t realize it was a whole other community where you can make even more virtual friends; that’s certainly been a fun surprise. I also thank Flickr for introducing me to MOO cards–tiny business cards, basically, but made with your own photos. I can’t wait to see them; I had them sent to my mom, and she and the cards will be here in a week! c. Copy and paste each of the URLs for the images into fd’s mosaic maker. Let me know if you play along! I’m going to give it a try! I can’t believe how much I don’t know about the internet/flickr/everything else computer/blogosphere related. I can’t speak for everyone, but for me at least, I’m *always* learning…isn’t it fun?! Wow! This is like work, will have to play with it. Your mosaic is great. What an inventive meme. I’m happy you posted this. I enjoy your photos and would like to add you as a contact or on Flickr. But I can’t figure out how. Can you explain? First you have to sign up for a Flickr account, which you can do from the main page. Then go here, to my profile page. Click “Add as a contact” on the right side. Then you can choose if you want to change our “relationship” (useful if you have photos you only show to friends/family, but I don’t as of now). That was too fun! Thanks! Rowena, have you seen the memes my dogs have filled out? It’s possible! And yes, I was lucky with my girls, but it’s a good thing that Luna came first; she is much more accepting than Stella would’ve been, I’m sure. MOO cards!!!!! okay, going to check that out right now. I started a Flickr account but never did anything with it. I need a secretary!!! I had a Flickr account for probably a year or more before I did anything too…but it’s that first step that’s so important. It seemed so overwhelming to me at first, and I still haven’t gotten all my older photos up, but it’s nice that I’m not even more months behind…. Moo cards. I have ’em. I love ’em. You can get ones that are a bit bigger, but not too big at Zazzle. I am a member of flicker, but hardly ever use it. I don’t know where everybody finds the time for all of this??? Don’t know if I’ll get a chance to play, but it is a very cute, creative meme!!! Thanks! I think you have to pick your battles with the online stuff. I simply refuse to get involved with Twitter b/c I know how much I’ll love it, and I don’t do Facebook/MySpace/LinkedIn, etc. either. I wish I could, but there just aren’t enough hours in the day…. I need to update my Flickr page. I couldn’t access it when I first moved to Rome because AT&T back in the States screwed up my yahoo account. I love flickr and I do see your new photos. nyc/caribbean ragazza’s last blog post..Help! I’m surrounded by boxes. Glad to see you’re out from under AT&T…yes, time to update that Flickr! Hi Michelle. Thanks for posting this, it was so much fun. Yes I have done my mosaic. Good job its raining and I have no work!! I have been at the computer most of the day. anne’s last blog post..Mosaics with Flickr. Fun! I’ll have to do that one later. Also, I am totally wondering what you typed for that second last one! I think you might end up typing it too Stefanie…. That is great! I’d love to do the meme, when I finish I’ll leave a comment here. My Flickr ID, by the way, is bonggamom, I’d love to add you as a Flickr Friend. PS: At first I thought the photo in the center was of P, and I thought GOOD LORD he is handsome, Michelle’s man is HOT !! Then I saw your photo credits at the bottom and realized my mistake! bonggamom’s last blog post..Bootcamp, Day 2 – File me under Weakling? I’ve never used flickr! I shall have to have a go, it looks fun! BecsLifeOnline’s last blog post..Welcome to my family Denisse! How incredibly fun! I have to try this as soon as school is really, really, truly out! This would be great to make for character collages, too. What a meanie blocking out your dessert! So I can totally say “You’re such an arse!” now, right? No offense taken? I haven’t played along, because I am experiencing severe memestipation as it is (terrible medical condition; I may have to drink a malted coffee milkshake from the local creamery to get over it — or several, over the course of several days). However, I just wanted to say that I absolutely love the image of the “escape” key escaping. Don’t mess with that memestipation, girl. Heck, drink a malted coffee milkshake for me as well…preventative measures…. OMG, I just LOVE the MOO cards!!! I’ve had them for over a year and they are so well received. Everyone I give them out to, loves them! In fact, it’s time to order another batch – thanks for the remider. You are going to love them – they come packaged in a cute little box and they are of such high quality, you’ll be amazed. I’ve already turned several of my friends on to them. I’m interested to know what you decided to put on the back of them. And then I have my phone number, email address and web site address. And I think they are perfect. I can’t wait till you get yours. Be sure to let us know how much you love them! I don’t remember exactly what I wrote on the back; I’ll definitely have to take some photos of them and post them here so others can see how cute and personalized they are! Well Daniel Craig is certainly not a *bad* choice Ariana…. You’d think I was living under a rock. I signed up for Flickr ages ago but never really jumped in to the pool, so to speak. I see there is a lot going on there and as you said another community connection in itself. This sounds like fun maybe I’ll give it a go. I recognised the first photo immediately. I discovered Michelle Caplan’s work a while ago and I fell in love. She does amazing work and was happy to see it in your mosaic. I’m happy to have found Michelle Caplan’s work through this exercise–so amazing! It’s so funny how many of us signed up for Flickr and then just didn’t get involved. For me at least, it seemed overwhelming, but once I got started, I was hooked 🙂 You would LOVE those MOO cards, btw…. I love flickr too! I just may give this a try! Fun. I just did it. I will post it sometime. 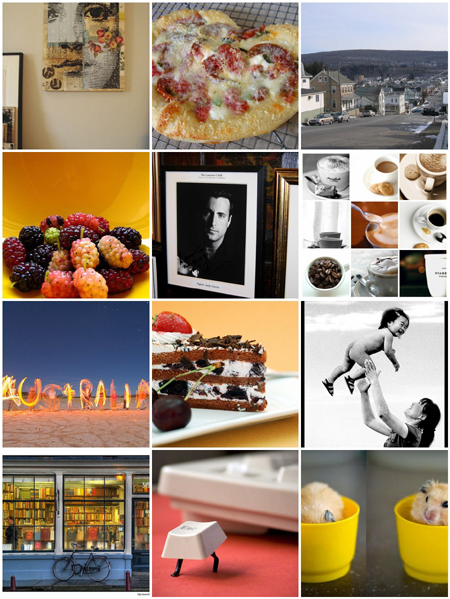 You know what… two of the pics in your mosaic turned up as options with my answers! You know, those berries kept coming up in my answers…I wonder if that was one of yours too? I loved doing this! You are the best, fearless girly girl, dear. So glad you enjoyed Irene! Love that! Andy Garcia huh? I played along. That was fun! Sì sì, I love my Andy 🙂 Glad you played too! I love the MOO cards. I’ve given all sorts of them as presents & they’re fabulous. And the meme looks fun. Maybe i’ll play. What a fun idea! I just had to do it, and I’m never really a fan of memes… there are some really great photographers out there on Flickr. Thanks for posting the idea! So, thanks a lot… It’s nearly midnight, and I’ve just spent more than an hour working on my mosaic! Everyone has gone to bed. Now I’m having trouble posting it to my blog, but Ill try in the morning when it will probably be easier. Couldn’t believe the wealth of images on flickr. And yes I need to update my stuff there. Under an Olive Tree’s last blog post..Little House on the Prairie…in Italy. Hah! I probably should’ve warned you that it’s a bit addictive…but then Flickr always is for me. So many great photos! I created my Flickr mosaic today, but will not post until sometime next week. I am backtracking to you through Scarlett and Viaggiatore. Both of your mosaics are quite beautiful. A very interesting visual meme. Thanks for getting it started! I like the escaping escape key! you and all the other she who blogs gals totally sucked me in with this one. 🙂 Just too much fun. sorry i’ve been MIA – i’m on a mission to delurk nowadays. And I’m so happy you jumped on this bandwagon…too fun not to! I played with the Flickr Mosaic tool. I am linking to a few ‘players’, yourself included, so folks can get an idea by seeing some of the mosaics, and play, too! What an amazing group of photographers on Flickr. I am honored to have their pics in my mosaic! Your mosaic looks great Leslie…lovin’ those chocolates 🙂 Thanks for the linky love! andy garcia! oh lord, what a dish!! well, I FINALLY participated 🙂 It was fun seeing all the other bloggers follow your lead. These were interesting to look at. So happy you played JR! I am getting on the road today for a day trip to Dallas>>>IKEA>>>where I usually shop in ITALY so this is funny to me to be going to TKEA in the US! I can’t wait to use my flickr for this mosaic ….I will make sure to share with you over the weekend! Thanx for the info! Pingback: dove mi porta il cuore » Blog Archive » this is me. now.